Here is a preview of the biography of Dr Schmittendahl, ‘Beethoven’s doctor’. This was written after an anxiety-provoking dream in which one of my senior colleagues looked incredulous when I admitted that I knew nothing about the illustrious (illusory?) doctor. I decided to invent a life and career for this person. Dr Mary Hann provided some wonderful illustrations. Dr Johannes Nepomuk Schmittendahl of Vienna. Although Dr Johannes Schmittendahl is best known for his association with the composer Ludwig van Beethoven, there are many other aspects of his life and work that reveal insights into the progress of scientific medical thought in late 18th and early 19th century Europe and indeed exert their influence today. This article aims to project a more rounded view of the man than is usually given both by dwelling on the significant contributions he made to medicine and also by giving some insight into the life of a man who amply qualifies for the epithet of Renaissance Man. His mother was of Nordic extraction (her father was the famous Dr Keilland) and his father Austrian. He was delivered in the family dwelling on the Baltic island of Bornholm. The later association of this island with the virus-induced disease is sadly ironic as it was probably this very illness that caused his death 87 years later. His father was an organgrinder and had pursued this profession for a few years in Denmark prior to his illustrious son’s birth. The reason for the family leaving Denmark is unknown but was probably economic as his father was a poor businessman. Schmittendahl’s early life was spent on the move as his father attempted unsuccessfully to sell his ground organs first, in the shape of patties, to the citizens of Hamburg, then, plain and unadulterated, in the city of Mintz and later, in the form of sausages, to the Frankfurters. The family eventually settled in Vienna. (“My father was the ‘wurst’ businessman ever”, Schmittendahl once asserted in a rare display of jocularity.) In Vienna, Herr Schmittendahl was able, at last, to make ends meet (a vital achievement for anyone depending on sausages for their livelihood). There is some conjecture as to the effect of this early childhood experience on Schmittendahl’s subsequent decision to become, somewhat exceptionally for that era, a vegetarian. (Prof Hazel Knutt is a proponent of an alternative theory that maintains that this dietary decision followed Dr Schmittendahl’s later visits to the towns of Lucerne, Graz and Oetz.) The effect of his vegetarianism on his scientific endeavours is discussed below. Of his medical training we know little. Contemporary records do however note that he was nearly expelled for converting his Professor of Medicine’s favourite leech to vegetarianism. Had he written up his methods, it is very likely that, rather than referring to “Pavlov’s dog”, Behavioural Scientists would talk of “Schmittendahl’s leech”. There is a lesson for every laggardly innovator in this story. Schmittendahl’s endeavours appear not to have been totally successful for the leech would only feed on plums and tomatoes. A crazed attack on a red pepper put paid to this “transgestite” (a term coined by Schmittendahl) creature’s existence. A sad day for science! One of the most remarked upon of Schmittendahl’s attributes was his dress sense. 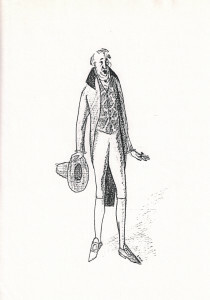 He was tall and very slim and would seem to have known exactly which frockcoats enhanced his natural grace of movement. At a time when scientific advances were experimentally being applied to medical practice, much to the chagrin of older practitioners, Schmittendahl represented the avant-garde of their application. His tutelage under Broussais in Paris placed him at the centre of medical ideas yet it was the fact of his being in Paris at a critical time that brought about some of his most original research. He was the first medical person to investigate what we now know as the post-traumatic stress disorder. His first descriptions, published in Der Medische Zeitgeistblad in 1795, are a product of research amongst the French aristocracy in the years after the French revolution. They reveal a remarkably sympathetic insight into the mental and physical manifestations of having witnessed your castle being razed to the ground by those you considered subhuman vermin and having seen your family and hunting dogs beheaded. It is not generally known that he tried to further these investigations by obtaining interviews with the victims of the guillotine in the immediate post-traumatic minutes. Unfortunately Der Medische Zeitgeistblad did not consider these interviews to warrant publication even as Short Reports. Ever resourceful and alert to the lessons life can teach the scientific mind, he capitalised on these experiences with extensive studies on the placebo effect using this inert pink draught. (Until then the placebo effect had been denied by all but the most rational of doctors and the most suicidal of those professionals loosely allied to medicine.) Schmittendahl showed unequivocally that all the unconscious memories so carefully unlocked from the minds of Vienna’s elite by Freud two generations later could have been completely expunged by thrice daily doses of his rosy elixir. The upper class neurasthenic Viennese women he treated, fully 60 years before Freud commenced his studies, acquired a new lease on life and could frequently be seen dancing the night away to the waltzes of Schubert and the elder Strauss. Their only complaint after the treatment was of a headache the next morning. It is a sad reflection on the philosophies of the day that these invigorating conclusions were suppressed by the medical press and have only recently been pieced together from Schmittendahl’s diaries. (For many years it was thought that the learned doctor had written these in code in the manner of Samuel Pepys. It is now evident that, like many of his 21st century professional descendants, his writing was almost totally illegible.) Researchers at Dons Sopwith University have been attempting, so far unsuccessfully, to recreate Schmittendahl’s formula. They do however consider that the pink hue was almost certainly due to Angostura Bitters. The Napoleonic wars provided Schmittendahl with an opportunity to investigate a problem for which, had his writing been better, the 20th century, with its far larger affrays, would have had great cause to be grateful. His studies relating the degree of circulatory shock to the number (rounded off to two decimal places) of limbs blasted off by cannon shot are a mathematical masterpiece. 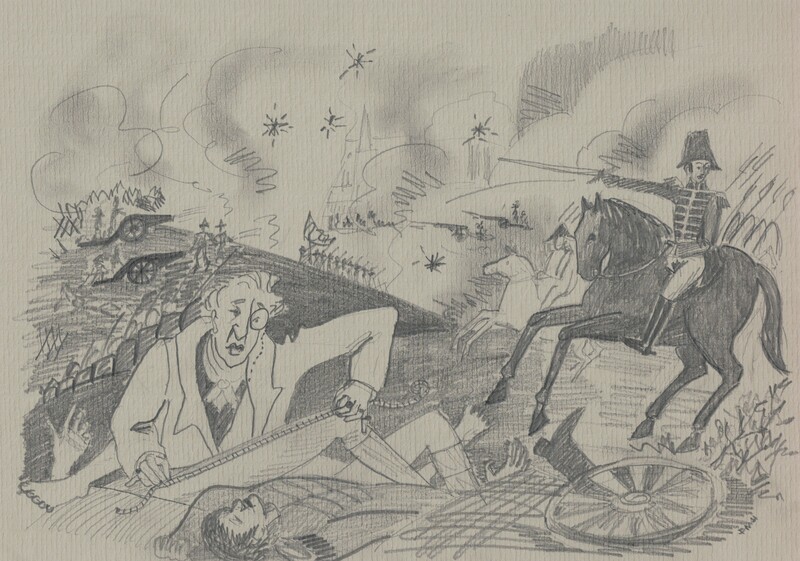 At the Battle of Borodino his etiolated, loping form was to be seen at every point on the battlefield painstakingly measuring shattered limbs and pulse rates. Schmittendahl took the opportunity, while measuring limbs, to further his studies of the human circulatory system. 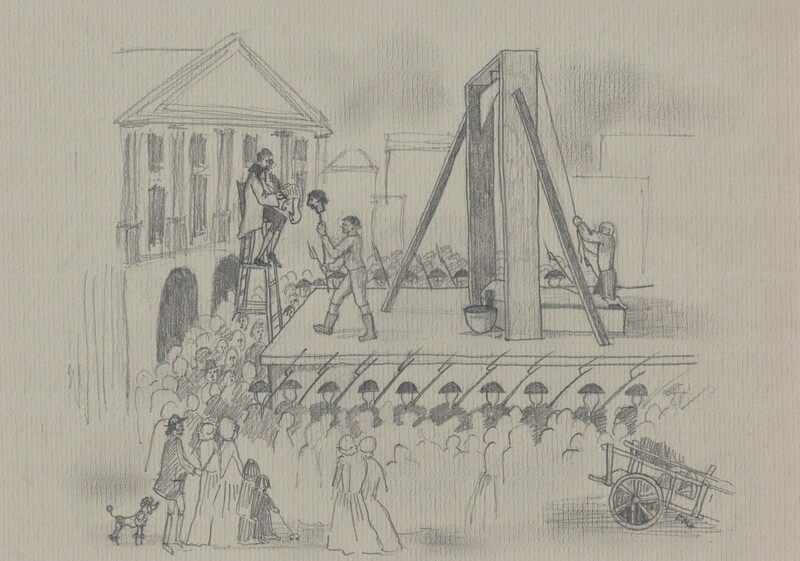 Some authors believe that this interest was kindled during his early researches at the knee of Madame Guillotine. One can understand how a young mind with a physiological bent could be fascinated by the effect of the sudden disappearance of the upper reaches of the carotid arteries. The acute severance of limbs in battle afforded Schmittendahl the opportunity to study the time between a cardiac impulse and the spurt of blood from the exposed Arteria femoris or other great vessel. By comparing different levels of traumatic amputation, he was able to describe the subtle changes the arterial circulation undergoes in the limbs. To accomplish this feat and obtain the measurements of the velocity of blood flow, he required a very accurate timepiece. He used only to purchase his fob-watches from Switzerland and it is owing to his extremely exacting standards that Swiss watches are what they are today. The watchmakers were kept busy because the doctor’s determination to be where the most untreated subjects were to be found (ie. in the heart of the battle) meant that his watches did not last long. During the Battle of Vittoria, for example, he went through 20 of them. At one point he briefly had to fall back on a cuckoo clock. Considering his fanatical need for rigorous scientific accuracy in all things, I am sure that Schmittendahl would have felt supremely at home in our era of time measurement by little atomic wobbles. Schmittendahl’s studies were dramatically cut short by the defeat of the French armies in 1813-4. This enforced curtailment was a crushing disappointment to him as he had just arrived at the point of preparing a hypothesis to account for the relationship between the signs of shock and the limb loss. As he comments in his diaries, “The course of true science never (illegible) smooth. What is war (illegible) well for if not to advance medical science??”. So deeply did this principled man feel this blow to the cause of science that, when he was appointed physician-in-residence to the Congress of Vienna, the blandishments of Prince Metternich himself could not persuade him to take up the post. As he tersely commented in the diary, “Schmitt. mit Metter., Nicht!”. One should avoid the temptation to look down one’s nose at Schmittendahl as he carefully took his readings while the stricken soldiers exsanguinated. Research ethics was a field as yet unconceived and, in the same arena of war, army surgeons were amputating limbs almost as fast and as often as cannon shot was able to. It would be a full century before there was a war big enough for real advances in the care of military casualties to be made. Research ethics took even longer to develop. The apparent contradiction between Schmittendahl’s strict vegetarianism and his equally single-minded forays into fields of bloody battle and anarchy have exercised the minds of medical philosophers and psychologists. 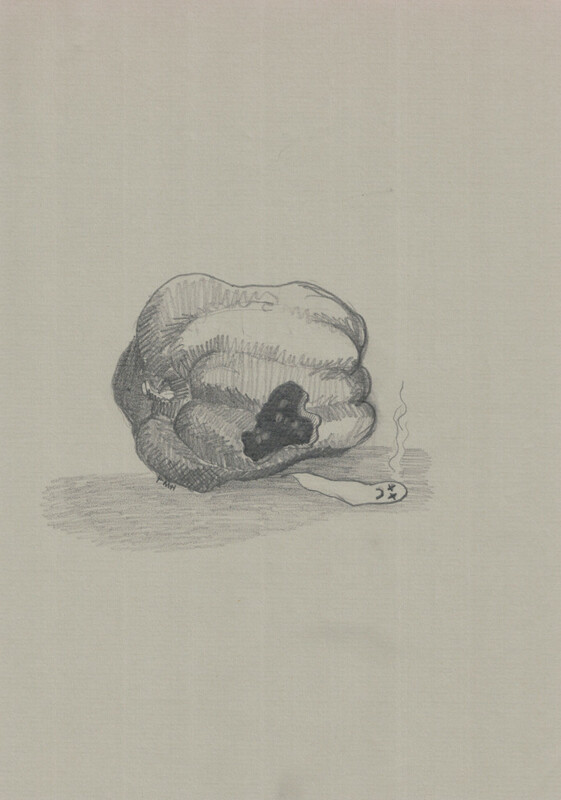 In “Legs and Legumes”, Professor Otto Robisch expresses the view that this was a sublimated response to bodily urgings brought on by severe nutritional anaemia. He cites the example of Dr Crippen who sublimated his highly pernicious anaemia rather less well. The putative connection between Schmittendahl’s vegetarianism and his father’s organgrinding activities has already been mentioned but Professor M.T. Wessel makes a most sound point when he states that the similarity in shape of limbs and sausages has not been given the weight it deserves. As he so cogently observes, “The longing for sausage that Schmittendahl could not allow himself to feel as a result of a childhood replete with meat may be at the heart of his later limb fixation. There is no known vegetable that can compare with a sleek, well-stuffed liver sausage…..” (Professor Wessel goes on to rhapsodise on the merits of sausage at this point rather losing his dialectical way). His point is somewhat undermined by the fact that, when he penned his thesis in the 1960s, he could not find a single Orthopaedic Surgeon who was a vegetarian. No discussion of Schmittendahl’s vegetarianism would be complete without reference to its influence on one important and remarkable line of research it led him into. Among famous vegetarians (a group surely worthy of a dedicated study) Schmittendahl stands out as being uniquely fastidious in his choice of plant foods. He developed a Europe-wide network of sources of first-rate fruit and vegetables. None pleased him more than a supply of peas and legumes obtained from a source in Bohemia. Ever appreciative of variety, Schmittendahl was struck by the sheer profusion of sizes, colours and even shapes of pea flowing from this direction. His diaries record an almost drooling anticipation of the next consignment of peas. A letter of gratitude he sent to this purveyor of peas par excellence was the start of a long correspondence with the gentle scientist, gardener and holy man, Gregor Mendel. It is, of course, fascinating and somewhat ironic to think of Schmittendahl consuming so eagerly the fruits of Mendel’s genetic experiments when the world of science only stumbled across his ground-breaking work many decades later. 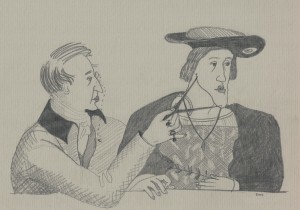 Unfortunately the correspondence between Schmittendahl and Mendel has not survived, but we can be almost certain that it was because of what he learnt from the humble monk that Schmittendahl set out upon what was to be arguably his most remarkable piece of research: an investigation into the genetics of the famed Habsburg chin. Just a cursory glance at the Habsburg family tree will show what a stupendous feat this research was. The incumbent Austrian Emperor had 15 siblings and his father was one of 16 children only three of whom died early. Schmittendahl’s fieldwork had him criss-crossing the European continent from court to court from Russia to Spain pursuing the many branches and blood-lines of the Austrian royal family. That Schmittendahl obtained the sanction of Emperor Francis 1 to execute his study speaks volumes of the importunate nature of the doctor’s persuasive powers and puts the puny dealings with Ethics Committees and Hospital Superintendents of his modern counterparts into the shade. This becomes all the more notable when one considers his methods. Schmittendahl developed a complicated formula relating his subjects’ age, height and length of mandible from the angle of the jaw to the most forward point of the chin to obtain what he termed a “Prognathian Index”. He also measured the angle of his subjects’ jaws and attempted to relate it both to the Prognathian Index and to the weights of the crowns which graced the royal heads. It has to be said that the trigonometry of this latter exercise defeated the good doctor, but his data do supply historians, jewellers and the few remaining crown-makers with the only substantive record of the heads which wore the crowns in 19th-century Europe. Schmittendahl used the Prognathian Index to show how the famous jaw was inherited and what his modern genetic counterpart would call the gene’s penetrance but which he very reasonably dubbed its “prominence”. In his eagerness he made the mistake of revealing some of his results prematurely and his dogged insistence on the veracity of the doubts his research cast on the hereditary claims of some minor royals had him drummed out of a few Spanish duchies and German Princedoms. His unbounded enthusiasm for his subject landed him in further trouble in the streets of Vienna. 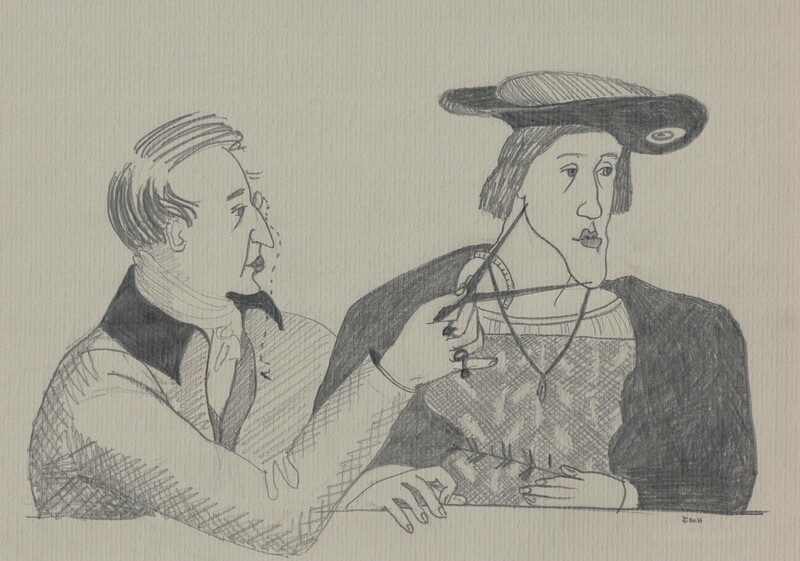 When his astute clinical eye caught sight of a jaw with the characteristics he had come to recognise as a result of his researches he would accost the hapless passer-by, whip out his tape measure, take his bemused subject’s mandibular measurements, execute a quick calculation and, in many cases, declare that the innocent member of the public was indubitably a Habsburg and pack him off to the imperial court to stake his claim. 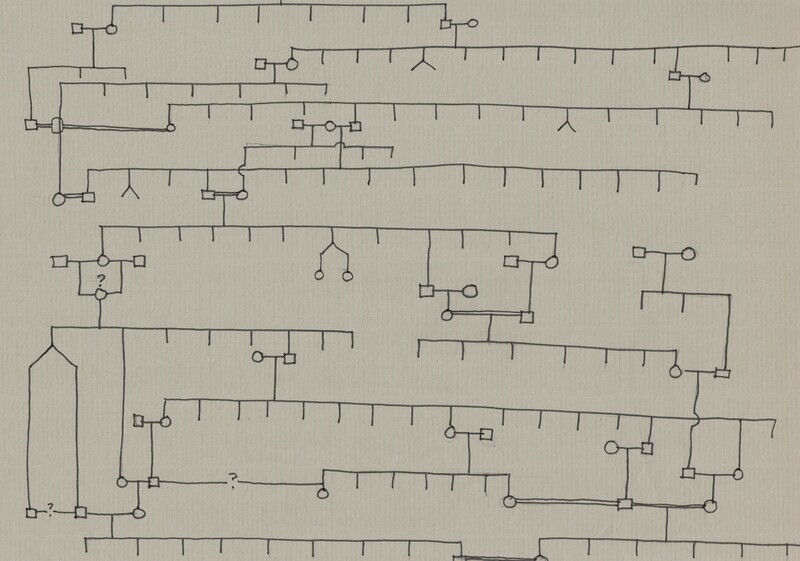 It is difficult to discern the full significance of Schmittendahl’s research on what one might term the “mental state of the Habsburg dynasty” amongst the welter of data and the family trees which resemble a tangled jungle of giant redwoods. Der Medische Zeitgeistblad ran to an extra edition to accommodate the papers this research generated. The chief fact that Schmittendahl established beyond any shadow of doubt was that the Habsburg chin was not a recessive trait. 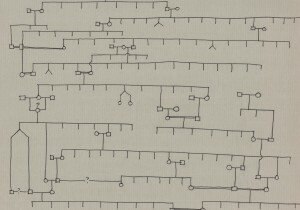 I believe that, had the Schittendahl-Mendel correspondence survived, it would show very clearly that Mendel’s use of the terms “recessive” and “dominant” to describe patterns of inheritance could be traced to Schmittendahl’s exhaustive and immensely original studies of the jutting jaws of the Habsburgs. 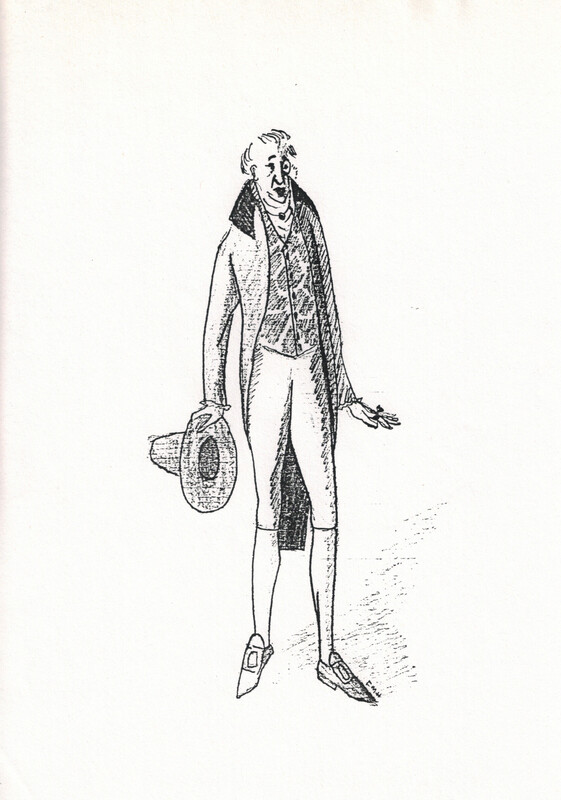 Schmittendahl never lost his interest in the implications of different jaw shapes and he died with an unfulfilled yen to substantiate his hypothesis that, in England, the depth of an aristocrat’s receding chin was proportional to his height in Burke’s Peerage. In his later years Schmittendahl admitted to another minor regret associated with this research. A wistful look would come into his eyes as he recalled the day in Paris a half-century before when he had found himself without a tape measure as he witnessed the final drop of Habsburg Marie Antoinette’s jaw. Before leaving the discussion of this research it should be noted that Schmittendahl’s use of the metric system in his jaw measurements has more significance than 20th century eyes would give it at first glance. Schmittendahl took these standards directly from the French National Assembly report published in the turbulent year of 1791 when he had had to leave the city in a hurry following his studies beneath the guillotine. Despite his frequent contact with the conservative ruling classes in France, Austria and, in the case of his Habsburg study, many other European countries, he always had a special respect for a republican movement which, while it had threatened his life, had also given rise to such rigorously scientific standards. He championed the use of the metric system in Austrian scientific circles and must be credited with its adoption in a country rabidly antipathetic to anything associated with revolutionary France. Schmittendahl’s effete, manicured look contrasted severely with Beethoven’s rough-and-ready mien yet seldom have two minds met in such harmony. The accounts of the two men enjoying country walks next to streams and through storms and dancing with thankful peasants while discoursing on the lowering effect of too many diminished sevenths on the mental faculties are very touching. Doubts have been cast on the depth of these conversations in view of the composer’s profound deafness but, having examined Schmittendahl’s bust in Vienna’s Eikopfsmuseum, I would contend that, if any lips were meant to be read, his were those lips. There can, however, be no doubt that Beethoven’s disability enabled his scientist friend to tap a seam of creativity the fecundity of which had no parallel in Schmittendahl’s richly innovative life. Having an unbendingly scientific mind, Schmittendahl sought to investigate the nature of the composer’s disability. His audiometric methods were beautifully suited to their subject yet they contained all the elements of modern audiometry. To assess Beethoven’s perception of sound conducted through the air, Schmittendahl employed the full range of his musical versatility. Playing every orchestral instrument from piccolo to contrabassoon at intensities from pianissimo to Beethoven’s own invention, the forte fortissimo, he meticulously charted the composer’s hearing. To assess conduction of sound through bone, Schmittendahl hit upon an original (and satisfyingly apt) idea. He looped double bass and violin strings round the composer’s ears. Then, by bowing at various tensions, he was able to explore the full range of perceptible frequencies. Schmittendahl’s audiometric methods were widely used by doctors in Europe for much of the 19th century. Enthusiasm waned rapidly after a disastrous attempt to measure Vincent van Gogh’s bone conduction when the string was allowed to get too taut. The medical profession of the time successfully covered up this scandal by putting the blame on the defenceless patient. For the composer, whose anguish at his relentless loss of hearing was intense, Schmittendahl’s experiments brought a measure of joy when he discovered that he was, in fact, able to hear the lower reaches of the contrabassoon’s range. He wasted no time in introducing the instrument into his orchestral palette from the 5th Symphony onwards. Such was his enthusiasm that he wrote prominent parts for the contrabassoon in his late String Quartets. 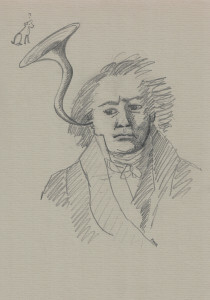 Only the earnest pleadings of Schmittendahl, who pointed to the effect on the listener with normal hearing being akin to “a hippopotamus conversing with the Graces”, persuaded Beethoven to rescore these works producing the compositions we now know; compositions that are considered to be quite complex enough. A recent performance by the Aesculapius Serpent Quintet using the original scores was politely if bemusedly received. In his approach to the treatment of deafness Schmittendahl eschewed the theories and practices of the Galvanic school. (The ministrations of Galvanic practitioners are probably responsible for the difficulty Beethoven had in controlling his hair.) The many appliances that Schmittendahl created in his attempts to restore Beethoven’s hearing have been lovingly preserved in the Imperial Ear Museum on the outskirts of the Austrian capital. (This museum is remarkable for its division into three large rooms the innermost of which is graced by a finely-wrought spiral staircase.) One of these hearing aids is pictured below. This illustration shows how prescient Schmittendahl was. His rather misguided attempt to create a steam-powered hearing aid is thought to have inspired the fiery last movement of Beethoven’s Moonlight Sonata. Beethoven’s sketches show that he had originally planned a gentle depiction of dawn for this movement. Before leaving the subject of the relationship between Schmittendahl and Beethoven there is one aspect which it would be remiss of me not to relate. It will have been gathered from these accounts of Schmittendahl’s rigorous medical research that he was a deeply serious man. In fact, the joke about his father’s mode of breadwinning referred to earlier is the only witticism he is known to have made. Because of this character trait (which, in the light of his stupendous productivity, one cannot criticise) his Viennese friends gave him the gently ironic nickname of “Freude” or, in English, “Joy”. There surely can be no greater tribute to Schmittendahl’s genius than that given by Beethoven in the glorious 9th Symphony. The Scherzo alone is a massive exploration of the rhythm of Schittendahl’s name; the Trio affectionately recalling their fraternal, bucolic walks. In the famous last movement, expressed in magnificent choral triumph is the composer’s vision of the humanistic, post-Enlightenment march of progress as epitomised by his scientific friend. Anyone doubting the veracity of this claim need only refer to the prominent and unusual use of the contrabassoon (that symbol of the mystical bond between composer and doctor) in the jaunty “Turkish” section of this movement. 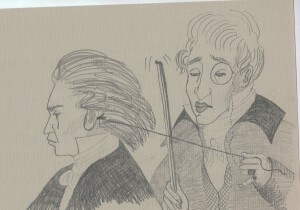 Here Beethoven tweeks his dear friend’s humourless nose with clashing cymbals and tinkling triangle while the tenor soloist exhorts us to follow in Schmittendahl’s questing footsteps. At the emotional first performance of this symphony the accolades for Schmittendahl were almost as great as those for the deaf composer who was continuing to beat time after the music had finished. Everyone realised then what this article has sought to prove to a new audience: that, when it comes to Beethoven’s music, how very much is owed to “Joy”. Illumination proved to be a problem in these endoscopic efforts but he was briefly successful with an indirect laryngoscope based upon the optic principle of the periscope and illuminated with light from the sun concentrated with a magnifying glass. This instrument he put to one side when his moustache caught fire. Over his attempts to produce a sigmoidoscope lit up by a magnesium flare it is best to draw a veil. Suffice it to record that there was a brief epidemic of a new syndrome for which the name Proctalgia fumax was coined. This article has only touched on a few aspects of Schmittendahl’s remarkable and lengthy career. Even in his last years he was very nimble and active. In the light of his earlier trailblazing studies in psychology it is interesting that at this time he struck up a very close friendship with Sigmund Freud’s mother. This has led to the suggestion that it should perhaps be Schmittendahl who deserves the epithet of “The Father of Psychoanalysis”. Be that as it may, there is hardly a branch of study of the human body, mind and spirit into which he did not put all of his creative energies and the world of medicine and music would be poorer without Dr Johannes Schmittendahl of Vienna, “Beethoven’s Doctor”.